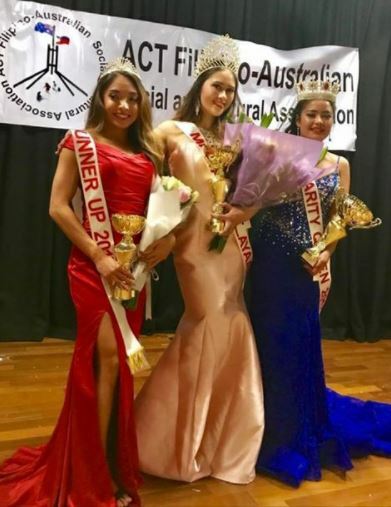 ​The ACT Filipino Australian-Social Cultural Association (ACTFA-SCA) is renowned over the decades for putting on fantastic events and they excelled themselves with their first beauty pageant held in October 2017 at the Southern Cross Ballroom in Woden, which is amongst one of the best venues in Canberra. The wonderful talent, spirit and beauty of the young ladies of the Mutya ng Kalayaan (Pearl of Independence) and Charity Queen contest were on show. Congratulations to the winners, the contestants, and the organising committee for such a wonderfully successful event. Emily James [photo above] was crowned the Mutya ng Kalayaan (Miss Pearl of Freedom) winner. Shamiya Grace Reyes [photo below left] was crowned Miss Charity Queen. In the photo below right AJ Manianglong, who won Miss Photogenic and best in Filipiniana is standing on the left in red gown next to Emily James, Mutya ng Kalayaan 2017 and Shamiya Grace Reyes, Miss Charity Queen. and Serina Bird Huang, Australian Diplomat, Department of Foreign Affairs and Trade (DFAT). Photos above: AJ Manianglong, Miss Photogenic and best in Filipiniana winner. 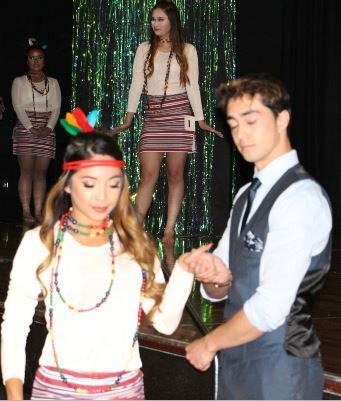 ​professional good-looking Australian-Filipino ushers, and ACTFA-SCA executive board member. Photo above right: Vhivien Puno, guest performer. Photo above right: Former beauty queens left to right - Hannah Arnold, Cha Jordanoski and Nicole Collins. Photo below: Left to right back row - AJ Manianglong, Emily James and Shamiya Grace Reyes with former beauty queen Cassie Rumsey in front lapping up the attention. Masters of Ceremony (MCs) for the Mutya ng Kalayaan 2017 were: Gloria Ross, RFA Director and Broadcaster and Alvin Mendoza, RFA Broadcaster.